Dog food brands are plentiful; but rare are the authentically healthy dog food brands that deliver on their high and mighty claims. The Association of American Feed Control Officials has very low standards when it comes to dog food labelling. In other words, fantastic claims can easily be made and mislead the general public. Only very savvy dog owners who can afford spending hours and hours searching for the most honest brand will be able to navigate through a web of lies or exaggerated promises written in bold font on a beautiful packaging. Marketing drives the healthy dog food market and it rests on a few buzzwords: complete and balanced, grain-free, raw, BARF, freeze-dried, vitamins, trace elements, PREY, amino acids, etc. 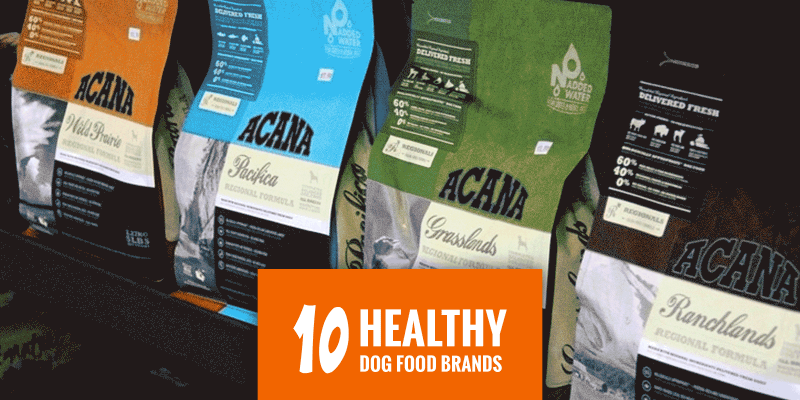 In order to help you out and shorten your decision making stage in your quest for the best healthy dog food brand, we have reviewed and compiled a list of brands we trust. To be fair, all brands exaggerate their claims and try to pretend that their kibble is better than the next one. This is fair play, but we just hate when this little game goes too far. We have not been paid or compensated by any of these brands. Ever. Orijen is manufactured in the United States. It is a high protein dry dog food. Orijen makes a puppy food, a large breed puppy food, and specialty dry foods for senior dogs and dogs that are overweight. The brand is sold in retail pet stores like Petco and Petsmart. It is, also, sold at Walmart. Amazon has most SKUs and is probably the best spot to get it from. A four and a half pound bag retails for $23, approximately. It provides a balanced diet appropriate for dogs. There have been conflicting stories about high protein dog food causing kidney stones but these studies aren’t thorough enough. Dogs naturally require a high protein intake so it only makes more sense to feed them a high-protein dog food. There are eight different kinds of dog food manufactured by Orijen. These include puppy, puppy large, original (chicken and fish flavored), six fish (including oily fish like mackerel that are high in essential fatty acids), Regional red (includes organ meat), Tundra, Fit & Trim, and Senior dog. All are labeled as “complete and balanced” which means that the dog food satisfies the guidelines of AAFCO. Orijen is present at most dog exhibitions and is loved by a lot of dog owners; the price tag may be a little steep for breeders who have several dogs to feed, though. Stella & Chewy’s makes five types of dog food. It has beef, chicken, chicken for small breeds, whitefish, and chicken for puppies. It is advertised as being grain-free, and potato-free. It includes canine probiotics, and omega fatty acids for coat health. The website states the dog food includes “organic” fruits and vegetables. The website states that is manufactured in the United States with no ingredients coming from China. There is, also, dog food that is described as “raw” which means that it is freeze dried. The recipe follows the whole prey model which means that the entire animal is used in the making of the dog food. Organ meats and bones are all put in the dog food. In this way, there is different sources of nutrients. In the wild, the entire carcass is consumed, and the theory goes that if that system is followed in making dog food the dog is more than likely to have the balance of nutrients needed. It isn’t clear how much is known about the nutritional requirements of dogs in its different stages of life. That makes substantiating the claims of various products very difficult to evaluate. Veterinarians are usually trained more in disease and disease prevention than dietary requirements for optimal health. A twenty-five ounce bag of patties is $48. 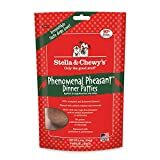 Stella & Chewy’s is available at Petco and Petsmart as well as online on Amazon.com. It is a wonderfully qualitative dry dog food with a very decent price tag considering its high nutritional profile. ACANA dog food advertises to include regionally grown meats and carbohydrates. It is supposed to be a biologically appropriate and balanced nutrition. They do not make any specialty dog food for puppies or seniors. This dog food costs $77 for a twenty-five pound bag. It is not the cheapest food around. The flavors include various chicken flavors, and fish. An oily fish like mackerel is in one of its formulas. Essential fatty acids contribute to coat health. ACANA has a frequent buyer program. After purchasing twelve bags of dog food, the thirteenth bag is free. ACANA is sold online, and is sold at major retailers like Petco, Petsmart, and Walmart. ACANA participates in a voluntary safety recall program. All dog food is manufactured in the United States or Canada. The dog food markets itself as a Whole Prey system in which organ, cartilage, and meat is all included. ACANA is a sub-brand from Orijen with a heavy focus on sourcing the best ingredients locally. Primal Pet Foods has nine different varieties of raw frozen dog foods. It has chicken, duck, venison, beef, lamb, pheasant, rabbit, turkey, sardine, and pork. The total protein content is often less than 20% which is very low for a healthy dog food brand. The website states that the dog food is suitable for all life stages and meets AAFCO guidelines for complete and balanced. The lack of dog food tailored for growing puppies and senior dogs makes the quality of this dog food circumspect since the nutritional needs of growing puppies and senior dogs are very different. It not easy to verify the whether or not this dog food is beneficial for the average dog. The website describes including organ meats and bones as part of the dog food. The low percentage of protein puts this claim in question. A fourteen ounce bag of the turkey and sardine is $31; this is a very expensive dog food compared to canned dog food and other dry dog foods. It is available online. Sardine is a cheap fish and there is some reviewers that have objected to the smell of the product. In general, the oily fish like sardines, mackerel have essential fatty acids which have been found to have some efficacy in maintaining a healthy coat. — Great Value for Money! Eagle Pack makes three different kinds of puppy food, and six different adult dry dog food. It includes a specially formulated puppy food for large/giant breeds. It, also, includes a reduced calorie dog food for overweight dogs. There is large and giant breed puppy food, original chicken meal and pork meal, and small breed chicken meal & pork meal puppy food. The adult food includes original Adult lamb meal and brown rice, original chicken meal and pork meal, reduced fat adult, large and giant breed adult, small breed chicken meal and pork meal, and power adult. The power adult dog food is for especially active dogs. It includes glucosamine hydrochloride to for joint health. 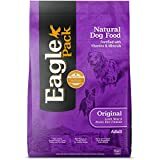 Eagle Pack is one of the more reasonably priced of the high-end dog food. A thirty pound bag of dog food costs about $40. This dog food is available on-line, and is available at all retail pet stores and Walmart. It is a complete and balanced dog food as certified by the Association of American Feed Control Officials. Eagle Pack is adored by dog breeders because of its compromise: it is available at a reasonable price and is a qualitative. The Fromm Family dog food looks like the menu from a five star restaurant. There are over two dozen varieties of dog food including such exotic flavors as Hasen Duckenpfeffer and Chicken au Frommage. All are complete and balanced so all are a healthy alternative. There are four different kinds of puppy food. One is specifically for large and giant breed puppies. There are two different dog foods just for weight management, and one dog food designed for senior or less active dogs. A couple of the alternatives include vegetables like broccoli and fruits like blueberries. It is not clear whether broccoli is an ingredient that most dogs would take to but it definitely offers a better nutritional profile. Warning, though, there is a fair amount of wheat in this brand of dog food. Dogs with allergies may have difficulty with a products that contain wheat. A thirty-three pound bag of food costs $50. Shipping is free with an online purchase. This dog food is available at Petco, Petsmart, and Amazon. It may be available at Walmart, but this high-end type of dog food is rarely stocked at Walmart. There are, also, a variety of canned dog food made by Fromm Family. — Very Promising Nutritional Profile! Nature’s Logic does not sell a puppy food or specialty food like weight control or senior dog food. It sells dry dog food in beef, chicken, duck and salmon, lamb, pork, rabbit, sardine, turkey, and venison. All varieties are balanced and complete. The sardine is an oily fish that contains essential fatty acids and probably would be good for coat health. The lean proteins like venison and rabbit are probably good choices if weight control is an issue with a particular dog. There seems to be a lot of spice listed in the ingredients as well as some probiotics that are of questionable nutritional value for dogs. Dogs have such keen sense smell that the preponderance of spice in this dog food seems more aimed at the human serving up the food than the dog’s sensibilities. A fifteen pound bag of this dog food costs $40. This dog food is available at Walmart, Petco and Petsmart. The company, also, manufactures a variety of canned dog foods, and treats. The company advertises that it does not add any synthetic chemicals or additives to its dog food. The addition of probiotics to the dog food seems to be a welcome additive, but let’s hope these do what they are meant to. Wysong manufactures eight different kinds of dog food. It has adult, growth (for puppies), senior, synorgon, fundamentals, anergen, vegan (are dogs going vegan, too? ), nurture with quail. Anergen is described as a hypoallergenic dog food for dogs with food sensitivities and intolerances. 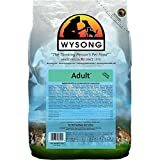 A five pound bag of Wysong dog food costs $25. It is available online and at Petco and Petsmart. There is some research suggesting that probiotics—at least the good bacteria in a dog’s gut—has benefits for dogs. Human probiotics probably will not hurt a dog, but the digestive system of a dog is significantly different. Lactobacillus acidophilus and enterococcus faecium (among others) have shown some efficacy in dogs. These bacteria are listed in the ingredients in the Wysong dog food. Strangely enough, nowhere on the website did the words “complete and balanced” appear. This is the minimum standard any dog food should meet. Hopefully Wysong has met the guidelines of AAFCO to ensure a dog’s health is not compromised by a poor choice of food, or cheaply sourced ingredients. Wysong has actually sued its rival company Purina claiming that Purina has made false advertising claims. The lawsuit contends that the pictures of premium grade cuts of meat are not contained in that bag of Purina dog chow. Advertising with those delicious looking pictures is more in the nature of puffing, and so how meritorious Wysong’s claims are against the pet food giant remain to be seen. Pinnacle makes six different varieties of dry dog food, and all are advertised as grain-free. There is chicken & vegetable, trout and sweet potato, duck and sweet potato, salmon & potato, and turkey and potato. The significance of being grain-free and then including a starch like potato seems inconsistent and a questionable marketing ploy. The total protein in the dog food is around 25%. 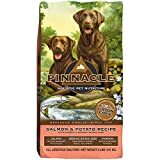 The Pinnacle brand’s website states that the dog food meets the AAFCO standards, but the words “complete and balanced” are conspicuously absent. No dog food that does not meet this minimum standard should be given to a dog. It is not possible to see the label on the dog food. There is no recipe designed specifically for puppies or for senior dogs. The dog food is labelled suitable for all life stages. The nutritional requirements of a growing puppy and a senior dog are very different so we think that there should be a distinction made between adulthood and puppyhood. The ingredients do show the probiotics that are good for dogs which is a plus! The percentage of protein should be higher especially if the product is advertised as being grain-free. Wheat is a grain that many dogs have allergies or sensitivities to. Potato is a complex carbohydrate (starch) that may fill a dog up, but does not offer much in the way of nutrient value. A four pound bag of dog food costs $24, It is sold online and at retail pet stores. Hi-Tek Naturals have several lines of dog foods. The perfectly natural line has a puppy formula, an adult dog, and a senior variety. All are advertised as being complete and balanced. There is a signature line of dog food that has classics, exotics and baked dog food in lamb, chicken, and pork. There is another line that is grain-free and includes lamb and herring, Alaskan fish recipe, and chicken and duck. These grain-free alternatives include potato or starch as one of the major ingredients. These dog food are likely to be filling for a dog, but they generally provide less than 20% of protein. There is, in addition, a premium blend of dog food for overweight and active dogs. The active dog food contains a bit more protein than the other varieties—at 26%. Unfortunately, though, it also lists wheat as one of its main ingredients. Dogs with food sensitivities may want to steer clear of this particular variety. A thirty pound bag of dog food costs $60. One problem with some of these natural products is that once the package is opened the dog food may spoil more easily. It probably does not save much money if the nutritional content of the dog food is subject to deterioration. This dog food is available online, and is sold at Walmart. I agree with the editor’s choice of dog food brands on this article. My dog kiki likes the Orijen (Chicken and Fish flavour) and I use it more often now. She has become fussy, haha…Yeah! Orijen is top of the top!